Heat oven to 400°F. Spread walnuts in ungreased shallow pan. Bake 3 to 7 minutes, stirring occasionally, until light brown. Set aside. Lightly spray large cookie sheet or 15x10x1-inch pan with CRISCO® Original No-Stick Cooking Spray. Unroll pizza crust dough on cookie sheet; press dough to 15x10-inch rectangle. Bake 8 to 12 minutes or edges are light golden brown. Spread pesto over partially baked crust. 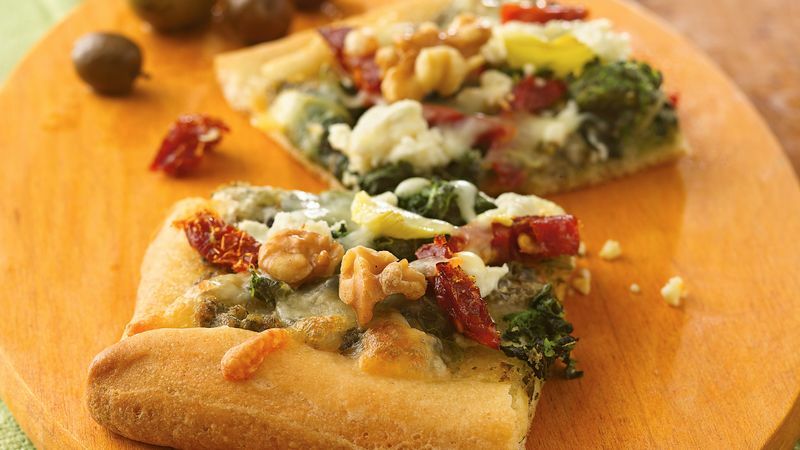 Top evenly with spinach, tomatoes, artichoke hearts, feta cheese and mozzarella cheese. Bake 8 to 15 minutes longer or until crust is golden brown and cheese is melted. Sprinkle with walnuts. Cut into 24 squares. Serve warm.